It would take a big set of Jaws to sink your teeth into this catch of the day. 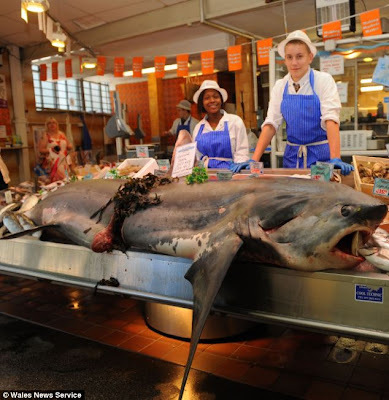 In fact, this fish is so big it could not even fit on a fishmonger's counter - let alone in a packet with chips. The 20ft-long Thresher shark is so big it had to chopped in half to fit on the counter. 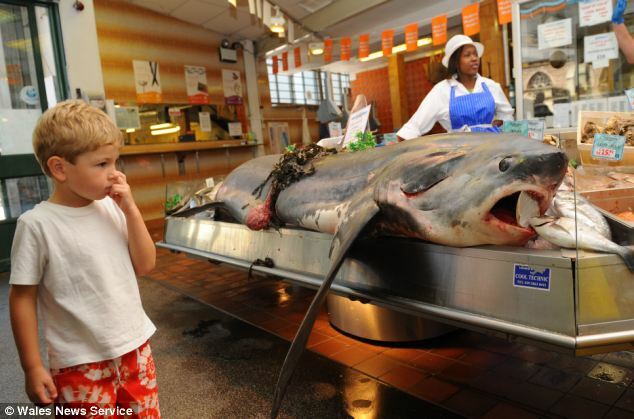 And the 550lb monster fish carries a hefty price tag of £3,000. 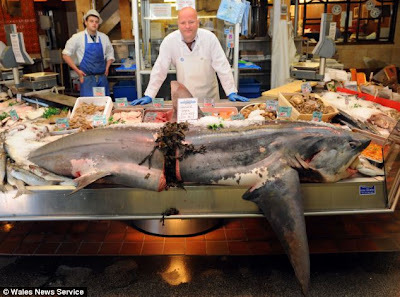 The shark was landed by the trawler The John Boy, in Falmouth, Cornwall, which was fishing for mackerel in the English Channel. It was bought by Ashton's Fishmongers in Cardiff market where people were queueing up to have their pictures taken with the Jaws lookalike. Stall manager Nick Adams, 55, said: 'Our customers can't believe their eyes - normally we sell cod, plaice and sea bass. 'We only get sharks in the summer when they come into British waters because of the warmer weather. 'We're hopeful we'll find a buyer for him, shark is usually very popular with our customers. Thresher sharks are more commonly found off the coast of Asia and North America. Customer Maria Parkham, 83, said: 'You'd need a hell of a lot of chips to go with that.